Realize double digit % cost reduction next to comprenhensive cost control, increased client satisfaction, obtain actionable organisational and operational tuning capabiliteit. This in 3 to 6 Months. Explore your, and your business partners, event data to discover financial, organisational and process improvement opportunities. Become operational process intelligent using the historic, and scored (*) process execution, as reference base to match actual execution for correction ‘in-flight’. Operationaly and Financialy Monitor the directional effect (+/-) of the actions/decisions taken. wodangroup.com, crossroad.be and integris.it provide the consulting & software integration services together with the liquid algorithms (*) to turn log data into predictive and prescriptive guidance to operators with real-time monitoring and ‘inflight intervention’ possibilities for management. (*) liquid algorithms: embedding the most effective process and data mining algorithms in current client operations for the time needed them to realize a business target. Liquid: switching/tuning algorithms and their resulting models this is an iterative business objective driven process itself. Businesses are drowning in data but starving for actionable insights and sustainable effects. Where to start? What business objectives to address? Which operational insights to exploit while monitoring the results of the actions while on ‘in-flight’? 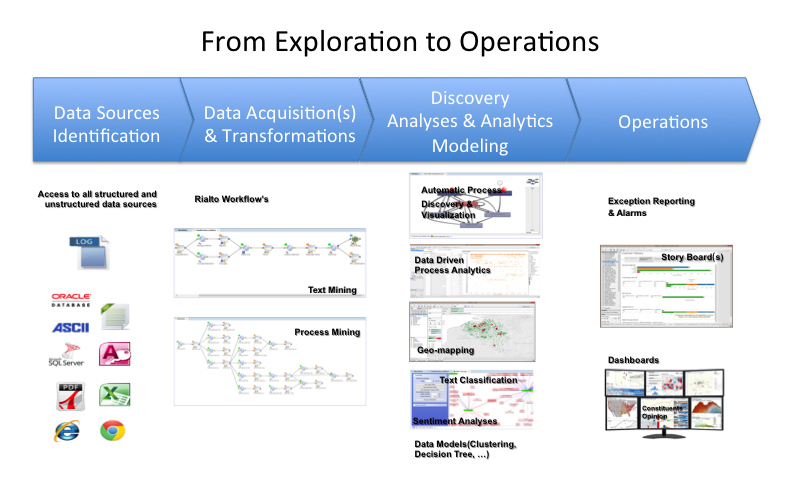 The data produced by any transaction system can be turned into vizual process and analytical business insights using process mining in combination with data mining. Being able to manage efficiently both internal and external (client) processes, together with monitoring the directional impact of the decisions taken, help realize the targetted objectives more effectively. The future starts today. Solutions in answering the needs of ever more demanding customers while facing the increased competition are available and affordable. The solutions offering is called: operational service process intelligent solutions. Since 2013 we are co-leading the trend to fuse new technologies to create “operational systems based on data driven process analytic insight”. We are advancing our approach and supporting technologies to provide service process execution analytic and monitoring solutions. The possibilities to exploit are multiple. Cost Monitoring: cost reducing where possible, incurring additional cost when beneficial (determine the real and actual processing cost of a Order to Cash, Procure to Pay, Insurance Claim, Intervention, … process). Assess the process execution variations for any of the stakeholders not at the least the clients. Learn from the past, Apply on the current, Steer for the future. Assign the best possible resource to the job or activity. Assign the best placed (compentence, experience, budgetairy advantageous) available individual or team. (not only available). 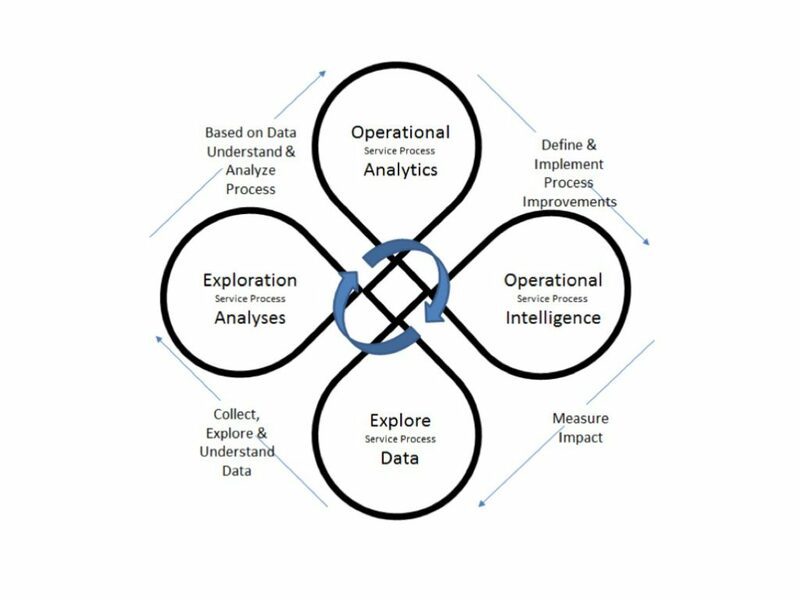 Use the process and data analytical insights (machine learning, artifical intelligence,…) and embrace foresight (predictive and prescriptive analytics) for guiding and training. We are able to realise this by embedding automatic process execution discovery algorithms for performance optimisation and compliance management operational solutions. Process Performance Monitoring: Situation: Service Level Agreements can not be reached. Time to deliver is below target. Solution: Weekly or daily event data gathering, preprocessing for analytics, data enrichment are the starting efforts. Conduct Process and Data analytics for ‘Insight’. Facilitate Interactive process execution insight workshops, using factual analytic data extracting trends and prepare predicties. Surface the factual best/worst process execution practices: Identify value leackage like process bottleneck(s), ping-pong behavior or excessive waiting time between activities. Deduct opportunities for improvement with anticipation of the timing of impact. The results becomming real. The effect of the corrective actions (decisions) can be observed using comparative analytics with a reference data store (learning data base). The actionable results are being provided using cockpits with actual measurements, reference measurements and alarms. The decisions are tracked for impact. Process Conformance Monitoring: Situation: Measurement of key activities for them always being: on time, all the time, everywhere and thouroughly performed. Compliance rules do not permit some activities being executed by the same person. 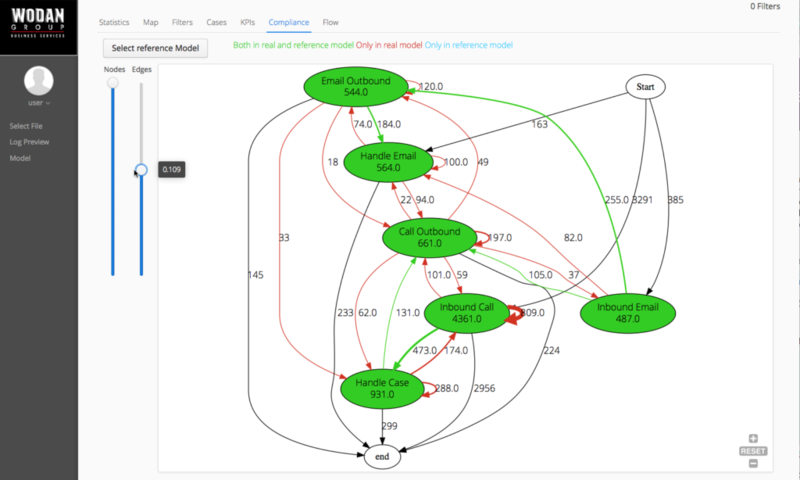 Solution: Process Mining with Event-Chain analytics. Potentialy combined with Data and Text-Mining. Together they are effective techniques to obtain factual insights for occurance and the gravity of the defects. The best possible root-cause analyses tooling? User adoption monitoring: Situation: People returning to old habits/procedures. Solution: After gaining insight in the real process execution, possible flaws are identified and quantified for their impact. The execution of the changes to the process execution are monitored using work hand-over flows between the resources involved in the process execution. Tracking the effect of the changes based on more discipline in data entry (improving data quality), additional resources or better co-ordination in the organisation (workload balancing based on skill versus availability).